Join a story circle and share your memories and stories of the Rockaways! Meet neighbors in this intimate and relaxed story-sharing space, listen to stories, and tell us about your most memorable experience in the Rockaways, a place you love to visit, changes you’ve seen, and more. This event is part of the Peninsula Library’s 31-Hour Summer Festival celebrating the end of summer. The library will be open for 31 hours straight from 10 am Saturday through 5 pm Sunday. Come enjoy fun activities and programs for everyone, including Book Jeopardy, board games, karaoke, a bonfire on the beach, sunrise yoga, and much more! 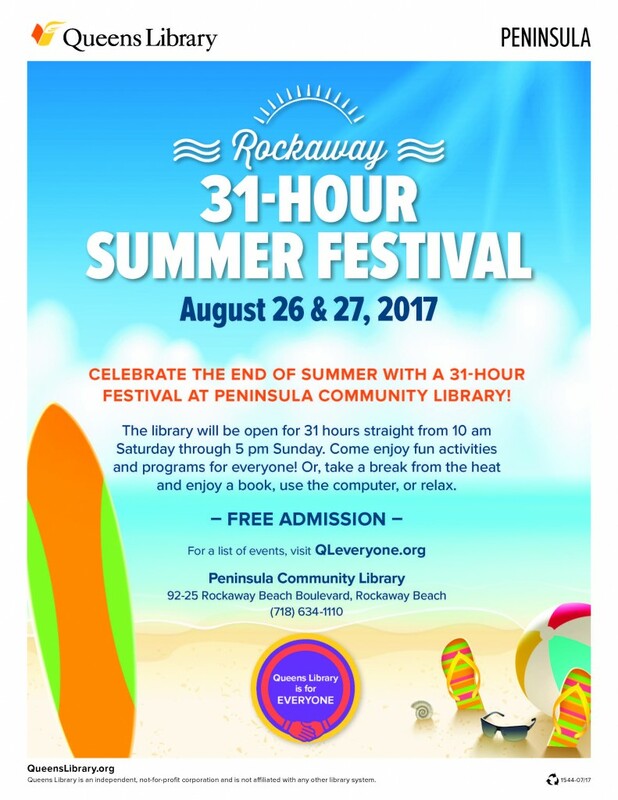 The Queens Library at Peninsula is located at 92-25 Rockaway Beach Blvd, near the corner of Beach 94th Street. Take the Far Rockaway-bound A train/ Shuttle to Beach 90th Street.